The Ultra 550 Under Cabinet Monitor Arm enables you to pull out your monitor when needed and fold it out of the way when not in use. The monitor can be adjusted 6″ (a5.2 cm) vertically on sliding rails and tilts, pans, and rotates for best ergonomic viewing to reduce eye and neck strain. 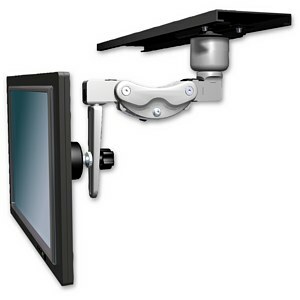 The Paralink adjuster provides 7″ (19 cm) of vertical adjustability for fine-tuning of monitor placement. This unique arm rotates 360° at the mount and glides 28″ (71 cm) horizontally on a track, to make full use of under-cabinet space in healthcare, dental, office, and educational settings. Machined out of aircraft-quality aluminum, this unit is powder coated with an attractive, durable finish. Hand assembly ensures that a quality product is shipped to you.